I've always loved log cabin and set out to make a queen sized quilt. As it grew and looked so good I decided to add sides and make the bedspread. It took me over 5 years to make in between many other quilts and crafts. I am new to quilting so spend a lot of time looking at quilts to get idea's. I hope that one day I will be able to produce something as wonderful as your quilt. It's the best one I have ever seen. hi, everyone and again thank you for the comments. Jenny this quilt is so beautiful. I would love to have this pattern to make one , I love the Log Cabin Pattern . Is there any way of me getting this pattern so I can make one . The colors and the flower appliques are just simply amazingly beautiful!! I bet you are proud to display it on your bed! thank you girls for your comments, yes i am very proud of it. This IS one of the most beautiful quilts I've ever seen. It just goes to show if we take our time, not rush, the finished product can be such quality. You did an amazing job and I love the applique design on the border. I'm giving you 10 stars for this! 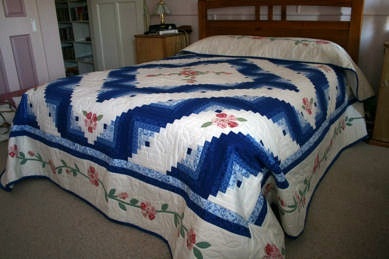 I think that is the most beautiful blue quilt that I have ever seen. Such a special use of a log cabin square.